While traveling and vacationing often have some amazingly enjoyable destinations, sometimes the journey can be a bit of a headache. From long security lines to delayed departures to lost baggage, it is easy to find yourself with an in-flight frown. However, you can remedy all that by hooking yourself up with the kind of luggage that ensures every aspect of your travels is enjoyable. Check out this feast of the best rolling gear bags from across the land, and as you dig in, look for the models with the qualities you value most when traveling. One look at the imposing Eagle Creek Flashpoint ORV Trunk 22 and it is easy to sense just how rugged this piece is. Constructed with Bi-Tech fabric to truly crank up the durability factor, this bag was created to keep up with your most punishing adventures. Weather-resistance and 4-Point Protection dominate the outside while the interior packs the capability to keep you super organized. Finally, you can rock a roller bag with some muscle. It’s all about efficiency when it comes to the Timbuk2 Copilot Rolling Gear Bag. A lightweight clamshell design gives you room to pack as impractically as you want. So, go ahead, toss those maracas in there, because you never know when a fiesta-inspired jam session might break out. And while it might be tempting to drop in the halfpipe on this thing since it features skateboard wheels and a bike-like handle, it is better off stowed in the overhead bin where it will be the envy of all other bags. Like an instant upgrade to first class, the Burton Rolling Gear Bag gets you where you are going in style. Somehow it slipped Burton’s mind that luggage is suppose to be boring. Instead, they loaded the Wheelie Flight Deck Rolling Gear Bag up with copious amounts of style, straps, handholds, easy access pockets and packing capabilities. Tugging your travel essentials around on a slick set of skate wheels has never looked so good. Help save the earth while you explore it with the Volcom Hemispheric Check-In Roller Bag. Built out of recycled materials, the Hemispheric rolling bag gets you onto the plane quicker with its smooth-rolling wheels and sturdy pull-out handle. A pair of zippered compartments gives you all the room you need to load up on souvenirs and perhaps the best part is that a percentage from every sale is donated to global environmental causes. There is no choice but to celebrate the no-nonsense attitude of the Gregory Alpaca Roller 22 Travel Bag. It doesn’t try to do anything fancy, but instead focuses on a 100% dedication to functionality. Abrasion and water resistant, this bombproof piece keeps all of your belongings safely tucked away in an easily transportable package. During your travels is the absolute worst time for gear to fail, so Gregory infused the Alpaca with an attitude that refuses to recognize failure as an option. Become an airport ninja and breeze past security with the Dakine Women’s Carry-On Roller. 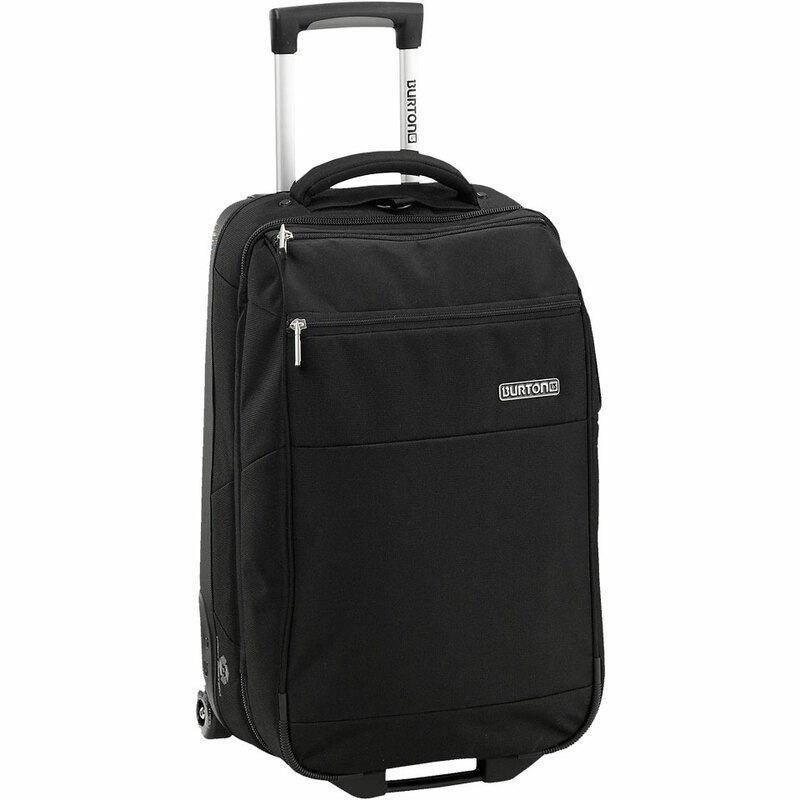 This rolling travel bag takes the pain out of traveling by giving you all the organization and simple handling of a hunk of luggage crafted specifically to dominate busy hubs. Long lines will never again make you cringe and you can forget worrying about having enough room for everything you might need. When you rock this bag and blitz past the suffering masses at the airport, you won’t be able to help but crack a smile. Don’t wait for the airlines to lose your luggage so that you can spend the next couple days in the same outfit. Instead, take charge with the carry-on sized rolling gear bag Dakine Girl’s Over Under. It has got a plethora of space for all your clothes thanks to a split level expandable design, and exterior organizer pockets help you stay on top of your essentials in order to make travel as painless as possible. So, which one will it be? Pick your favorite, load it up and let getting there actually be half the fun. Howdy, I hopped over to your blog via Digg. Not an item I ordinarily read, but I love dakine bags and although I like your perspectives nevertheless. Thanks a ton for composing something worthy of reading!